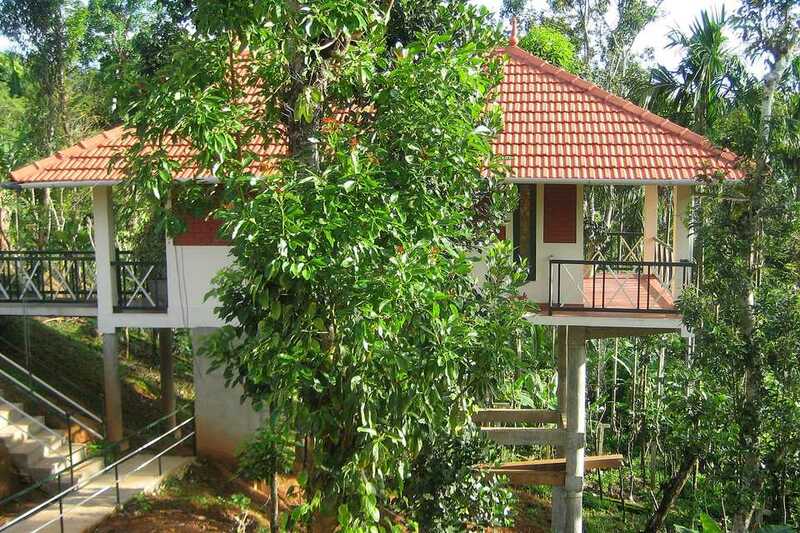 Glenora is an unforgettably tranquil homestay in Wayanad, Kerala. Its luxury cottages have unsurpassed views of the sunrise and valley below. The coffee and spice plantation, and organic fruit orchard, that surrounds the cottages adds to the enchantment. Glenora homestay is located on a 90 acre coffee and spice plantation in the Wayanad district of north-east Kerala, which borders Karnataka state. It has views all the way to Ooty, in Tamil Nadu. Wayanad, a bright green mountainous region that stretches for over 2,000 square kilometers along the Western Ghats, has a great deal of scenic appeal. Abundant coconut palms, thick forests, paddy fields, and lofty peaks form the landscape. Due to the nature of its terrain, the area also has much to offer adventure enthusiasts. Glenora homestay isn't the easiest place to reach, but this adds to its wonderful sense of seclusion. It's located around two and a half hours drive (120 kilometers/75 miles) from the nearest airport in Calicut. The nearest railway station is also in Calicut. The windy road passes by vibrantly painted, imposing two story houses, flourishing plant life, and rolling tea and coffee plantations. The approach to Glenora is thick with vegetation, including jack fruit trees and eye-catching red hibiscus flowers. The whole area is fertile and unspoiled, and home to a wide variety of birds and animals. Monkeys and peacocks are regular visitors to the estate, host and owner Mr Rajagopal informed, me as crickets chirped and birds sung enthusiastically around us. I didn't actually get to see any, although I did hear the shrill call of a peacock on numerous occasions. Mr Rajagopal has been running the estate, which is a family property, for around 40 years. He and his wife are very welcoming, and went out of their way to make sure I was comfortable during my stay. There are two luxury cottages on the property. The design of these cottages is undoubtedly the most outstanding aspect of Glenora homestay. Situated a short walk from the hosts' home, the cottages have been built, on concrete stilts, into the side of the slope. The balcony of each cottage overhangs the valley, providing a deep and uninterrupted view into the plantation. The effect is that it feels like you're living in a tree house. Relaxing on my balcony, I was immediately aware of nature gently working its soothing wonders on my body, which was tense from the journey. I found it easy to imagine I was the only person on earth. Normally, I don't like to get up too early in the morning, but the host's photos of the sunrise convinced me that it was a sight to behold. I left the blinds in my cottage open, and woke up to a sky stained with hues of deep red and orange. This gradually gave way to yellow, as the sun began peaking above the horizon. Soon, the whole valley was illuminated in its warm glow. There was such an incredible feeling of stillness. I sat on my balcony, with piping hot coffee from the estate, and immersed myself in the morning's energy. The cottages are priced at 6,600 rupees per night, including breakfast and tax. Cheaper rooms, costing about 4,000 rupees per night, are also available. With the exception of afternoon snacks, all meals are served in the hosts' home. I feasted on an appetizing variety of traditional Kerala cuisine, which is quite mild and coconut based. As to be expected on a coffee estate, there was no shortage of fine filtered coffee. In addition, the hosts surprised me with a number of tasty treats. Upon arrival, I was greeted with a sweet welcome drink made out of coconut milk. In the evening, I relaxed with a glass or two of fruit wine, made on the estate from homegrown champa fruit. A really appealing thing about Genora homestay is the hosts' organic fruit and vegetable garden. After exploring it with Mr Rajagopal, I was delighted to be able to sample fresh guava, limes, and other fruit picked straight from the trees. According to the host, birds love to eat the fruit that's growing on the estate, leaving only around 25% of the crop. I can see why. It's so succulent. Guests who are interested in Indian cooking will be pleased to be invited into the kitchen at Glenora homestay. It's possible to watch the food being prepared, and even participate in the cooking process. I find that it's easiest to learn Indian cooking through observation, making this a rare opportunity to uncover a few secrets. Each cottage at Glenora is well equipped with bath tub, shower, 24 hour hot water, fan, refrigerator, television, and filter coffee making machine. Internet access is available in the hosts' home. There's also a small library for guests to use. In case of electricity outages, solar power is used as a backup. Hindu guests will appreciate the attractive puja room in the host's home, with calming devotional chants that waft softly in the background throughout the day. Whilst Glenora is an excellent place to relax, there's no shortage of activities to keep guests busy. A visit to nearby Sunrise Point is worthwhile. Mr Rajagopal also takes guests on misty early morning walks through the plantation, where it's possible to see and learn about the produce growing on the property. Not just limited to coffee, it includes betel nut, rubber, cardamom, cinnamon, vanilla, and pepper. Sightseeing trips are easily arranged to popular attractions such as Chembra Peak (for trekking), Edakkal Caves, Wayanad Wildlife Sanctuary, and various waterfalls, temples, and handicraft centers. One of the best months to visit Glenora is January, when the coffee harvesting takes place. Guests can participate in the process. Sitting around a winter bonfire at night also makes this time of year enjoyable. Visit their website or read reviews and compare prices on Tripadvisor.